Who Can I Be Now? (1974–1976) is a box set by David Bowie, released on 23 September 2016, focused on the artist's "American Phase". A follow-up to the 2015 compilation Five Years (1969–1973), Who Can I Be Now? (1974–1976) covers the period of Bowie's career from 1974 to 1976 over twelve compact discs or thirteen LPs. Exclusive to the box sets is The Gouster, a previously unreleased album that eventually became Young Americans, and Re:Call 2, a new compilation of non-album singles, single versions, and B-sides that serves as the sequel to Re:Call 1 from Five Years. The box set includes remastered editions of the studio albums Diamond Dogs, Young Americans, and Station to Station, the latter in its original and 2010 mixes. (The remix of Station to Station, by coproducer Harry Maslin, was first made available on the 2010 deluxe edition of that album.) It also includes David Live (in original and 2005 mixes) and Live Nassau Coliseum '76, a recording of Bowie's 23 March 1976 concert at Nassau Coliseum during his Isolar Tour, previously available on the 2010 special and deluxe editions of Station to Station. The set comes with a hardcover book that includes photos from Eric Stephen Jacobs, Tom Kelley, backup singer Geoffrey MacCormack, Terry O'Neill, Steve Schapiro, and more, as well as liner notes penned by Bowie’s close collaborators Tony Visconti and Harry Maslin and a handwritten note from Bowie about The Gouster. On the CD version of the album, all the tracks are in the same sequence on two discs: disc 1 ends at "Watch That Man", disc 2 starts at "Knock on Wood". ^ Erlewine, Stephen Thomas. "David Bowie - 'Who Can I Be Now? (1974–1976)". AllMusic. Retrieved 11 August 2017. ^ "David Bowie - 'Who Can I Be Now? (1974–1976)". Mojo: 104. November 2016. ^ "David Bowie - 'Who Can I Be Now? (1974–1976)". Uncut: 49. November 2016. ^ McCormick, Neil (24 September 2016). "David Bowie's lost 70's albums The Gouster is like the holy grail of pop - review". The Daily Telegraph. Retrieved 11 August 2017. ^ Gerard, Chris (29 September 2016). "David Bowie - 'Who Can I Be Now? (1974–1976)". PopMatters. Retrieved 11 August 2017. ^ Hernandez, Raoul (16 December 2016). "Review: David Bowie - Who Can I Be Now? [1974–1976] (Rhino/Parlaphone)". The Austin Chronicle. Retrieved 11 August 2017. ^ "David Bowie - Who Can I Be Now? (1974–1976)". Magnet (136): 52. ^ Atkins, Jamie. "Bowie: Who Can I Be Now?". Record Collector. Retrieved 11 August 2017. ^ Shafer, Cody Ray (21 October 2016). "Bowie: Who Can I Be Now? (1974–1976)". Under The Rader. Retrieved 11 August 2017. ^ Petridis, Alex (22 September 2016). "David Bowie - 'Who Can I Be Now? (1974–1976) review - an Artist on the edge". The Guardian. Retrieved 11 August 2017. ^ "David Bowie box set Who Can I Be Now? – details of unreleased material, b-sides and more". The Guardian. 25 July 2016. Retrieved 5 August 2016. ^ Eede, Christian (27 July 2017). "New Bowie Box Set Announced". The Quietus. Retrieved 5 August 2016. ^ Kreps, Daniel (22 July 2016). 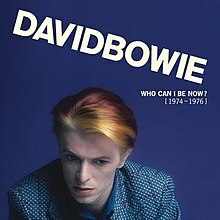 "David Bowie's 'American Phase' Features on 'Who Can I Be Now?' Box Set". Rolling Stone. Retrieved 5 August 2016. ^ Lozano, Kevin (22 July 2016). "David Bowie's Who Can I Be Now? (1974 – 1976) Box Set Detailed". Pitchfork. Retrieved 5 August 2016. ^ "Austriancharts.at – David Bowie – Who Can I Be Now? (1974-1976)" (in German). Hung Medien. Retrieved 2016-10-06. ^ "Ultratop.be – David Bowie – Who Can I Be Now? (1974-1976)" (in Dutch). Hung Medien. Retrieved 2016-09-30. ^ "Ultratop.be – David Bowie – Who Can I Be Now? (1974-1976)" (in French). Hung Medien. Retrieved 2016-09-30. ^ "Dutchcharts.nl – David Bowie – Who Can I Be Now? (1974-1976)" (in Dutch). Hung Medien. Retrieved 2016-10-03. ^ "Le Top de la semaine : Top Albums Fusionnes - SNEP (Week 39, 2016)" (in French). Syndicat National de l'Édition Phonographique. Retrieved 4 October 2016. ^ "Offiziellecharts.de – David Bowie – Who Can I Be Now? (1974-1976)" (in German). GfK Entertainment Charts. Retrieved 2016-10-01. ^ "GFK Chart-Track Albums: Week 39, 2016". Chart-Track. IRMA. Retrieved 2016-09-30. ^ "Album – Classifica settimanale WK 39 (dal 2016-09-23 al 2016-09-29)" (in Italian). Federazione Industria Musicale Italiana. Retrieved 1 October 2016. ^ "VG-lista - Topp 40 Album uke 39, 2016". VG-lista. Retrieved 1 October 2016. ^ "Official Scottish Albums Chart Top 100". Official Charts Company. Retrieved 2016-10-01. ^ "Official Albums Chart Top 100". Official Charts Company. Retrieved 2016-10-01. ^ "David Bowie Chart History (Billboard 200)". Billboard. Retrieved 2016-10-04.